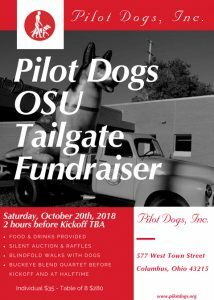 Come tailgate with us at Pilot Dogs for the OSU game. Music, Games, Raffles, Prizes, Silent Auction, Drinks & Snacks provided throughout the game. Buckeye Blend Quartet will perform a half hour before kickoff and at halftime. Advanced Tickets Only! We sell out every year!